When Patterns Don’t Flatter – Which Dress Did I Keep? I’ve written about the ability patterns have to visually camouflage and challenge our perception of depth. They are ideal for creating leaner silhouettes by tricking the eye. 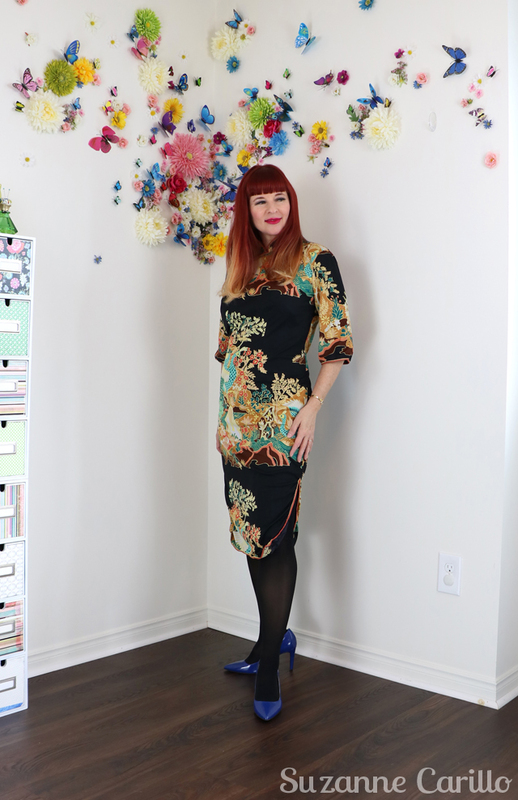 I purchased two lovely vintage dressed about five months ago at the Toronto Vintage Clothing Show, neither of which I’d photographed myself wearing until recently. Needless to say when I saw the photos my opinion about the dresses changed. This 1960s cheongsam dress ticked all the right boxes for me. The colours and graphic design seduced me into panic buying it at the very last minute as the vendors began closing up their booths. I also bought a “wild and crazy” maxi dress from the 70’s. No surprise there as I have a weakness for this type of dress. They command attention while allowing me to indulge in as many desserts as I like. The cold and somewhat putrid “greige” colours on this maxi were not ideal for me. Nope…deeper, darker jewel tone colours look better on me. This is what they mean when they tell you as you get older you get wiser, you know not to go deep sea fishing after a night of partying or wear faded repulsive colours next to your face. Apparently I haven’t allowed all my 51 years of wisdom to sink in yet and took one last hit of retail therapy before the show closed and the dress came home with me regardless. Let’s talk about the negative space issue of dress #1. It is hitting me all places it shouldn’t. I need that negative space in my mid section and thighs. Instead, the graphic pattern and bright colours framed by negative space create a convex illusion at my waist. What about the shape of the dress? Although the shape of the dress was okay for my body type it wasn’t doing me any favours either. Pumps would be necessary to elongate my legs which means no booties or ankle straps. The amount of wear I’d get out of this dress was diminishing as was my self confidence. Did I make the right choice buying this dress? Although I wasn’t sure of the colours on this dress the orange is near my face, not the greige so that works. The pattern draws the eyes upwards to my face in what almost looks like an inverted chest cavity. It’s a bit freaky but kind of cool at the same time, like I have a full body tattoo. The dress works very well with my little blue velvet Elvis booties and as I mentioned before, I can eat and move with abandon. Which dress did I choose to keep and which dress did I choose to sell? Which one would you have kept? 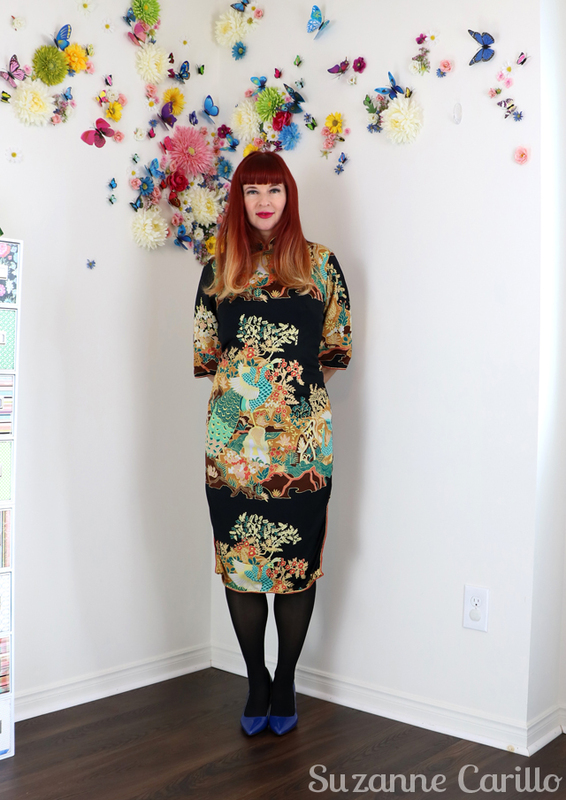 If you guessed the Asian cheongsam is now for sale you are one smart cookie! Go get yourself a treat. On me. Whatever you have in the cupboard that you know you shouldn’t be eating will work nicely. I promise you won’t gain an ounce. This is my gift to you. You earned it. If you had asked me before I took these photos which dress I’d be keeping it would have been the other way around. The camera certainly shines another light on our perception. Although I love patterns they don’t always flatter our bodies depending on negative space and pattern placement. Dark negative space will create visual recesses. Ideally this should be placed at the waist or on the sides of a dress. Colourful graphic images or patterns sandwiched between negative spaces will draw the eyes in and add visual weight. Negative space is a visual frame drawing the eyes towards the centre of the frame. Balanced overall pattern (especially when smaller) will read as a solid to the eyes. Large bold graphic patterns can work as long as their lines create figure flattering curves. Lines, curves, highlights and lowlights on patterns all direct the eyes and can create optical illusions. Make sure the pattern accentuates all you love about your body. Something to think about the next time you’re making an impulse buy at a vintage show. Have you ever changed your mind about a piece of clothing after you saw photos of yourself wearing it? Lots of great information here! I have trouble with pattern and if I am going to end up not liking a purchase it’s nearly always a patterned one. Eventually I learned that I need more subtle graphic patterns in low -medium contrast colours but those are not as easily found. I love florals but they look all wrong on me so I vicariously enjoy them on others. It’s amazing what a photo shows us that a mirror doesn’t. I like the Asian one on you best but I’ve noticed that I am a person who notices colour first so it’s the colours of the Asian dress that I love on you and respond to before I notice any ‘issues’ with it. Thanks for the interesting and valuable lesson on the pattern placement! the hippy dress is very cool!! What an amazing way to look at all of the aspects of these dresses, Suzanne. Sometimes you like or don’t like a dress for a reason, but I can’t always put my finger on the why! Of course, anytime I see someone in something other than jeans and a t-shirt (can you tell denver is uber casual?) I think they look good just for the fact they are putting some effort into their appearance!! Yes, yes, yes! You definitely chose the right one. I am a poor patternless woman and I don’t know if that will ever change. You, however, should never stop wearing patterns, they look wonderful on you. And you look comfortable in them because they seem to suit your personality. I think it’s so interesting what we are all comfortable in and what makes us feel kind of “fake,” not me. Great analysis! Thanks. I guessed it wrong!!!!! I thought you kept the Chinese patterned dress! Well, I ate what I “shouldn’t” anyway 🙂 I will put on weight because I was wrong 🙂 (argh!) I don’t know, I liked that dress on you, but I now what you mean – if you think that the negative spaces weren’t flattering, you know it better, of course. As for your question, yes… I saw myself wearing a white coat – the coat was amazing… took a picture in Gdansk and then I saw it… horrendous. I looked like a 6 month-old polar bear. Driving to Bratislava, I saw a box on the street, for donations. I left the coat there. Never regretted the decision. There are things that photos reveal what we don’t see before 🙂 Hope you have a nice week, Suzanne! Hugs! Oh yes, a blue fuzzy cardigan. After I saw the pictures, I never wore it anywhere else than at home. I guessed which one you were going to keep. 😊. Well, I have seldom discarded a piece because of what a camera said. I am too stubborn. I just force the piece to work and trash the photos. Hahaha! This is also why my closet is ready to burst. I like both of the dresses but see the reasons you are selling the cheongsam one. At least you have a thriving store to put it in, which is excellent. I do love both of these dresses and can see why you bought them. I think you look amazingly great in the cheongsam…maybe it’s the colors that just make your hair and skin look fantastic. OK, no treats for me! I do think I’d be keeping the other as well, just because it would be so easy to wear. hahaha I chose the cheongsam as the one you kept. I agree with Maggie ^ comment above me. The colors in the print highlighted your hair and skin. I like to see 70s stuff but never wear it – I would dissolve into an ectoplasmic sweaty mess in that non-breathable polyester. YAY! I guessed correctly, for the reasons that you have pointed out. I don’t wear patterns often unless they are stripes or polka dots, so I don’t usually have to scrutinize a patterned piece of clothing so carefully with regard to where the pattern falls and whether it draws the eye up and down, or across. That said, I have got rid of things I’ve barely worn because of how they looked in a photograph. I find photos a great aid to wardrobe editing! In fact, I intend to spend this coming weekend doing just that, I have been in a bit of a rut and need to pull together some new outfits. I think you’ve kept the better dress, as the orange color is near your face, the pattern is kinda flattering and cool, and it would look nice with any purple accessories (or a purple coat!). I have a weakness for purple, so I’d vote for it!. Even if the cheongshan dress was cute, it’s so dissapointing that the bigger part of the print was just in the midsection. That’s something I try to avoid too!. And you’re not going to enjoy wearing it if you think all the time that it’s not flattering! Yes, Suzanne I think you made the right choice. 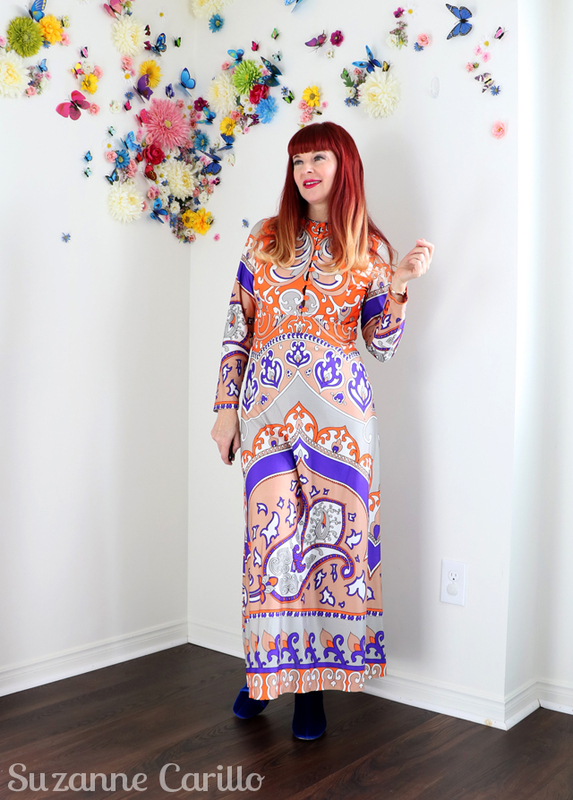 They were both fabulous dresses but the maxi is more flattering on you and you could wear an orange coloured neck scarf with it to bring even more colour to your face. It does look lovely on you. I always think you look fabulous in whatever you wear because you carry it with confidence. But I see now that it’s because you’re also discerning, choosing outfits that suit not only your personality but feature the best parts of you while camouflaging the parts that make you feel less confident. As Anita said above, you do pattern so well. I can’t imagine you in a patternless outfit. 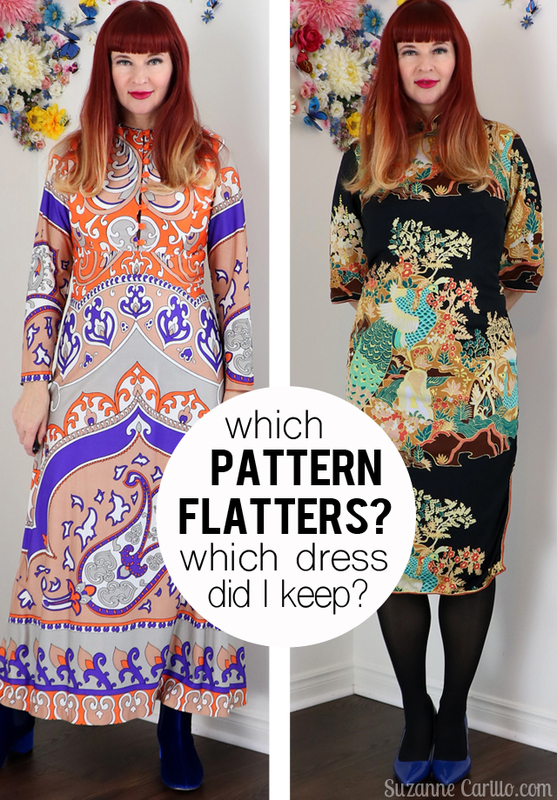 I’m so glad both dresses featured such bold patterns so that whichever one you chose was YOU! Sigh. I love both dresses. Sometimes the mirror gives you bad information. It does not tell you what address looks like when you move. But I know you know your own style, and you have to be comfortable with what you wear. And of course, choosing the right pattern, with the blue velvet boots, is a big priority. Great post! 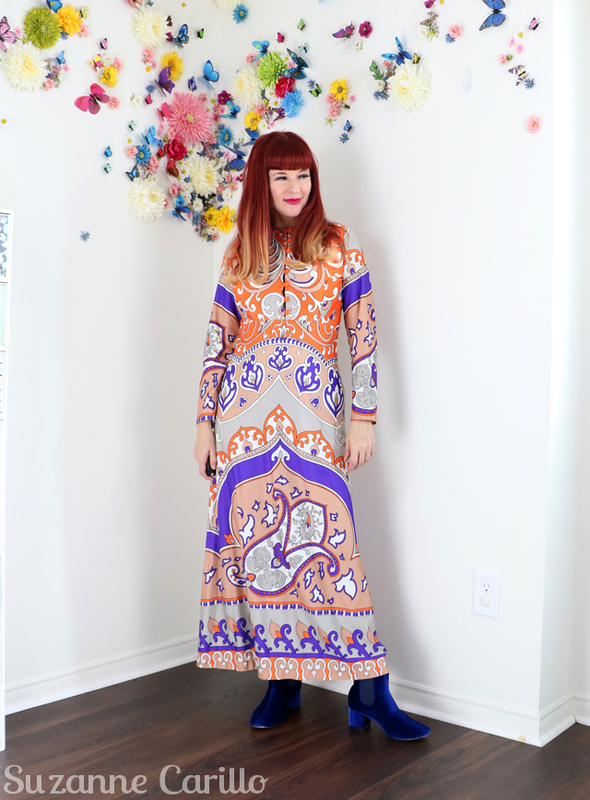 I chose the more flattering dress that seems reminiscent of a Peter Max print. Given the size of the cheongsam dress it seems likely that the dress won’t flatter anyone’s figure. What a pity. I hope someone takes a leap of faith. You made the right choice. Though I do like both dresses, I can see what you mean. But the greige color in the maxi really doesn’t wash you out since it isn’t right up next to your face. And orange and purple are two colors that look great on you. I laughed about the tequila hangover reference. Brought back memories of one of my birthday celebrations back in the days I worked in the Caribbean as a yacht chef. Worst hangover ever! Think it took about a week to get over it. Haven’t touched a drop of te-killya since. These are very good tips! I generally have a fairly good idea of what “works” for me, but then sometimes I decide to try new things. . . and then regret it 🙂 I definitely have changed my mind on garments once I look at a picture! I think that was a good move to keep the maxi dress- the bold print is really fun and the sweep of the dress really suits you, even if the colours aren’t your favourite.